We don’t like cricket, we love it. In glorious sunshine up at the Phoenix Park the ESB cricket side commenced their defence of the Willie Webster trophy with an emphatic win over the Glasnevin Gravediggers. Bowling first, a good all round team performance applied pressure throughout with the highlights being Bob Mullard’s three wickets in an over the Ryan Cartmill taking the final two. Killian Morgan also shone behind the stumps in a new role. The target of 74 was never enough. Baajee Dabhade and Koustav Modak (39 not out) put on a fifty run partnership for the first wicket and the final winning margin was 9 wickets. Next match is Wednesday 8th June. With excellent clubhouse facilities, it’s a great way to spend a few hours on a summers evening so why not come along. Attached are the results of the MADSOC draw for April 2016. Congratulations to all our winners. Caption: Team Ireland Athlete, Fiona Doyle. As part of our sponsorship of Team Ireland for the Rio Olympics, we are proud to partner with RTÉ on the documentary, The Road To Rio which continues tonight for the fourth episode. This week we get a glimpse into Olympic Walker, Rob Heffernan’s life as he defends his world championship title in Beijing. We also look at the trials and tribulations faced by sailors, Matthew McGovern and Ryan Seaton. We are also introduced to Paul Pollock from the Irish Olympic Marathon team. Don’t forget to tune into RTE 2 tonight at 8.30pm. 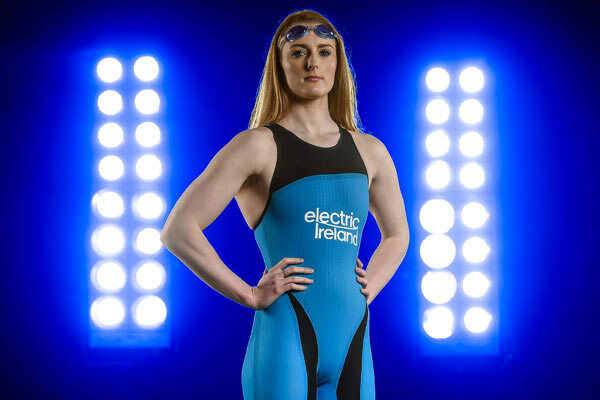 Fiona Doyle, one of the latest athletes to feature in The Power Within campaign, came agonisingly close to a medal at the recent European Swimming Championships in London. The Limerick breaststroker finished fourth in the 100m final, less than two tenths of a second (.16 to be exact) off bronze. When I was at my lowest point, after narrowly failing to qualify for London 2012, they were the ones who got me through it. Team Ireland 2016 looks set to break the 80-athlete mark as it is already up to 74, including the 16-man hockey squad. Badminton’s Chloe Magee and Scott Evans will contest their third Games, Aileen Reid will race in her second and her triathlon teammate Byran Keane finally nailed his Olympic debut by finishing 20th at a World Cup event in Japan last month. Natalya Coyle missed out a place in the final of modern pentathlon’s recent World Championships by a mere six points and now faces a wait to see if she will get through as Europe’s first reserve. Electric Ireland, as Team Ireland sponsors, is urging everyone to get to UCD on June 25-26 where the Irish women’s rugby Sevens team can qualify if they win the Olympic qualifying tournament being hosted by the IRFU. Follow the stories at #ThePowerWithin. Dublin Shakespeare Society presents Staging McGahern 2016 from 7th to 11th June in Teachers’ Club, Parnell Square, Dublin 1. The death has occurred of our Friend and Colleague Frank O’Brien, Electric Ireland, Swift Square and formerly of ESB, Chapel Street Dundalk and ESB Monaghan. Frank (Francis) O’Brien died 31st May 2016 peacefully surrounded by his loving family. Sadly missed by his loving wife Bridget, daughters Caroline and Siobhan, son Shane, sons in law Robert and Jonathan, his mother Teresa, brothers, sisters, relatives and friends. Reposing at his home from 10 am on Wednesday 1st June. Removal on Thursday morning 02nd June arriving at St Mary’s Church Threemilehouse for Funeral Mass at 11am followed by burial in the adjoining cemetery. Family flowers only please, donations if desired to Cavan/Monaghan Palliative Care Team and Crocus Cancer Support Centre, care of the undertaker. House strictly private on Thursday morning please. The will take place on Thursday, 23 June on Sandymount Strand, starting at 6.30pm. This is a timed 5k race/ fun run, and it is open to everyone in ESB to take part. It should be a great event, with winners’ prizes, goody bags, spot prizes and a BBQ afterwards in Sportsco. The first 100 people who enter will also receive an Electric Ireland ‘Team Ireland’ T-shirt. The entry fee of ?20 will go entirely to ElectricAid. You can sign up for the race using the online form on the event SharePoint site below. For anyone who would like to volunteer to help out on the day, there is also a link to the volunteer sign up page. Delicious HB ice-cream in wafers will be served in the Head Office Canteen at lunchtime on Wednesday 1st June. All proceeds are for Down Syndrome Ireland (suggested donation ?2 per slice). Vanilla, Raspberry Ripple, Banana and Neopolitan flavours available! I decided in the early nineties I would be leaving the ESB in 2015, just after my 60th birthday. Since I had a few more stories to tell and retell the best stories to newer recruits departure was delayed till 2016. The departure day finally came last Friday. I had said goodbye to my Cork and Limerick colleagues in April, with a few final stories. Cakes in the tea room, a presentation in the canteen and drinks in the Leop Inn completed the goodbyes and stories Last Friday. Thanks to everyone for the great send off, gifts, cards and emails. To my surprise I was with the last three to leave the Leop Inn. But as usual it was more stories than drink. The last eight years in renewable planning was where I found my niche and so it’s appropriate to leave at the top of my game. Last Friday was a great night with representatives from my early days in ESB up to my current colleagues in Renewables. Thanks especially to the retirees who attended, it’s good to know I had not been forgotten by the elder and wiser statesmen. ESB Musical & Dramatic Society (MADSOC) will be holding it’s AGM on Thursday 23rd June 2016 at 6 pm in Oil Can Harry’s Mount Street. All MADSOC members are invited to attend this AGM. The 2016 Annual Sligo Walk took place on Saturday 14th May in beautiful sunshine which highlighted even more the stunning scenery along the walk route. 160 walkers from all over the country took part and afterwards enjoyed the craic & festivities at the very popular Weary Walkers Waltz. Our thanks to the Order of Malta who were along the route and provided very welcoming foot baths at the end and special thanks to all the staff current and retired who year after year come out on this special day to provide water, bars, fruit and support to all the walkers. Walk times and Photos are available now on the intranet site and www.esbstaffservices.com. Date for your Diary: The 2017 walk takes place on Saturday 20th May. My family and I would like to express our sincere thanks to all our friends and colleagues throughout the ESB for their wonderful support and kindness to us after the sad loss of my wife Marian. We are so grateful to those who travelled to attended the funeral Mass. Many thanks for all the cards, texts, calls and words of support. It made a huge difference at this sad time. Thank you all. On behalf of my wife, sons and extended family, I would like to thank Electric Ireland and ESB for the wonderful send off on the 6th of May. Thank you to all those who sent cards, emails, texts or left phone messages. The turnout in the Waterloo was amazing and it was wonderful to see so many former colleagues on the night. I would like to thank Paul for his kind words and sense of humour, and also a huge thank you to Gerry and his Finance team for all the research and photos that were part of the presentation. I would like to thank Aine, Marie and Sean for co-ordinating events in the Waterloo, including flowers, cake and the excellent sound system. Could I say a special thank you to Nuala, Aine and Anne Marie for the fantastic collection and sincerely hope that no legs were broken, or threatened, in the process!! Finally, could I express my admiration for those that were still standing at 2.00 am, and later. I’m truly impressed by your stamina, particularly those that still managed to fulfil their commitment to the Darkness into Light walks in the early hours of Saturday morning. We all enjoyed what was a wonderful night. I would like to wish you health and happiness in the future and hope to maintain contact over the coming months and years. DUNNE, Gerard – May 30, 2016, (Clondalkin and formerly of Stanaway Road and Kilmainham) (peacefully), surrounded by his loving family in Our Lady’s Hospice, Harold’s Cross, beloved husband of the late Elizabeth (Betty), loving father to Sharon, Majella, Tony and Gerard; sadly missed by his loving family, daughter-in-law, sons-in-law, grandchildren, brothers, sisters, relatives, family and friends. Reposing Tuesday, 31st May 2016, in Our Lady’s Hospice, Harold’s Cross, from 4pm to 7pm. Funeral on Wednesday, 1st June, to St. Agnes’s Church, Crumlin Village, arriving for 11.30am Funeral Mass with burial thereafter in Newland’s Cross Cemetery. Family flowers only. Donations, if desired, to Our Lady’s Hospice, Harold’s Cross. All enquiries to Stafford’s Funeral Home, North Frederick Street ph: 8743735. Delicious HB ice-cream in wafers will be served　in the HO Canteen at lunchtime on　Tuesday and Wednesday this week. All proceeds are for Down Syndrome Ireland (suggested donation ?2 per slice). ElectricAid is honoured and blessed to be the beneficiary of two great events in June. Our EURO2016 Predictor Competition is open for applicants and going well. Entries close at 12 noon on June 10th, just before the big kick-off. ESB AC’s ESB 5k Challenge on Sandymount Strand is on 23rd June, followed by a social and BBQ in SportsCo. This is open for entries up to 21st June – with the first 100 entries scoring a fabulous Team Ireland Rio 2016 T-shirt. We have raised ?60,000 over the last 5 years. Thank you all.